An orthoplane can be drawn after step 1. Initial Processing has been completed. 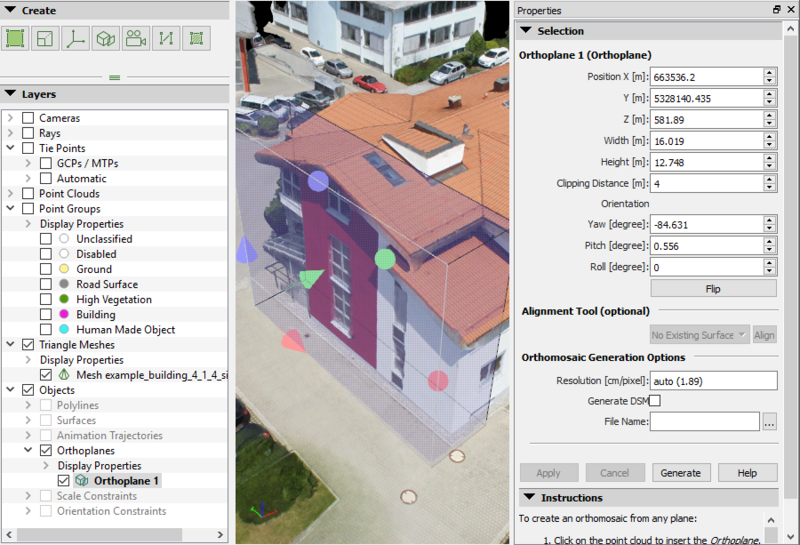 An orthomosaic of a facade (or orthofacade) can only be generated after step 2. Point Cloud and Mesh has been completed. 2. On the menu bar, click rayCloud > New Orthoplane. 3. In the 3D View, an orthoplane box appears beside the mouse. Left-click to place the box on a 3D point. Warning: The green arrow should point towards the object to be orthorectified. Red arrow to move it towards the X direction. Green arrow to move it towards the Y direction. Blue arrow to move it towards the Z direction. Or use the Position (X,Y,Z) options of the right sidebar: Menu View > rayCloud > Right sidebar > Objects. Red sphere to resize the X length. Green sphere to resize the Y length. Blue sphere to resize the Z length. Or use the Width, Height, Clipping Distance options of the right sidebar: Menu View > rayCloud > Right sidebar > Objects. Use the Orientation (Yaw, Pitch, Roll) options of the right sidebar to rotate the orthoplane box: Menu View > rayCloud > Right sidebar > Objects. Note: All the points included in the orthoplane box are used for the orthomosaic generation. 5. (optional) Click Flip to change the orientation and direction of the orthoplane. 6. (optional) If at least one surface object is drawn (How to draw a Surface in the rayCloud), click Align to align the orthoplane with an existing surface. (Select the desired surface from the drop-down list). 7. Click Apply to save the changes made under the Properties section of the right sidebar. 1. Draw a New Orthoplane. For step by step instructions: How to draw a new orthoplane. 2. Set the Resolution [cm/pixel] of the orthomosaic. 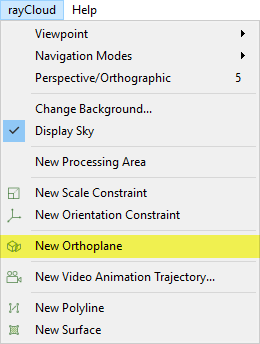 For more information about the orthoplane options: Menu View > rayCloud > Right sidebar > Objects. 3. (optional) Select the Generate DSM box to generate a DSM. 4. Select the file path where the orthomosaic will be stored. Only one orthomosaic can be generated at a time. The generated orthomosaic is not georeferenced. Important: If the generated orthomosaic is distorted with background information, improve the results by masking the background: How to remove the Background of the Orthoplane using the Annotation Tool . Hi, the generated ortomosaic is it to scale? in my experience it seems the photo is not to scale when I input it into autocad. The ortho generated when using an orthoplane is not georeferenced but it is scaled. It has the same scale as the project. Hi Daniel, but when I import into autocad I did some quick measurement and it is not tally with the actual size. Is your Pix4D project scaled? By saying that I mean if you have either GCPs or a scale constraint. I was wondering if there was a way to edit the facade in mosaic editor? No, there is no way to edit the facade in Mosaic Editor. 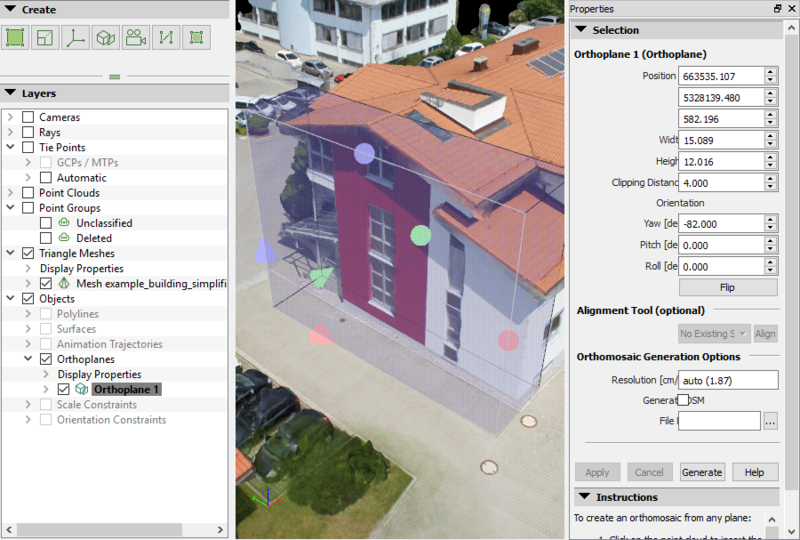 Every change should be done prior to facade generation, for example using the Annotation Tool. More in the video above.